Posted August 15, 2014 by Eric Graham . While the recent attempts by organizations to blackmail/extort webmasters and website owners are not necessarily new, they might be new to many of you. We wanted to take a moment and help you understand what is going on out there in cyberspace, including some ways you can combat these threats. Essentially what is happening this time around is that some ill-founded websites are sending out mass emails to website owners threatening to create 1000s of spammy backlinks…thus creating a possible “manual” penalty from Google that can include up to deindexing, or removing, your website form being listed on Google. A recent Google Penguin algorithm update, stated that link building schemes from a website would no longer be tolerated, and in turn can and will be penalized for such action. A few years ago, in order to elevate SEO for a particular website, companies were essentially paying people to build backlinks on hundreds if not thousands of other websites to create additional SEO juice. Google came down on these website employing these tactics by delisting them from Google search engine results. Not a good scenario if your business relies on your website for business and sales. Google did create some ways to reverse the punishment, but much of the damage was already done. 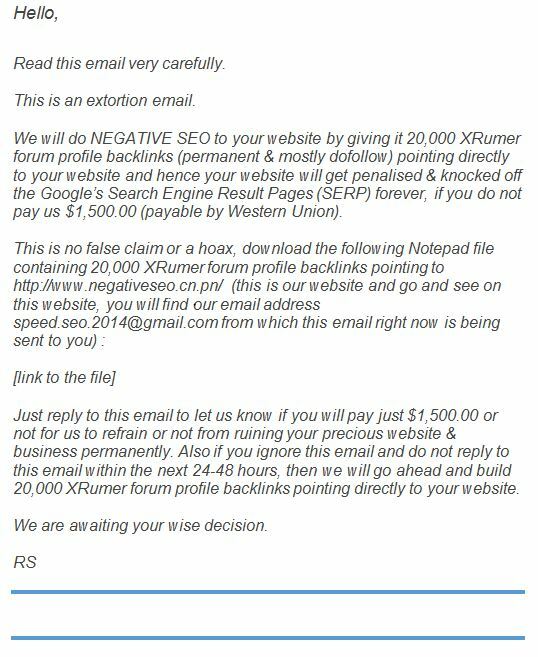 We forwarded these negative SEO extortion emails to Google and Google responded that they have “investigated” the claims. They added that it is “unclear how credible this threat really is.” Google told us their “algorithms are designed to prevent these kinds of activities from causing problems for webmasters. But if you are concerned about specific links, “you can also choose to use the disavow tool,” Google told us. In addition, Google is recommending you “report extortion to law enforcement,” although that doesn’t do much good if the email comes from countries law enforcement has no control over. But if it is received on Gmail, Google asks you to report it at: https://support.google.com/mail/contact/abuse. Truth is, negative SEO extortion is not new. I reported about cases of this back in January but this specific email is going out to many, many webmasters and site owners. If you are concerned, yes, use the disavow tool. But make sure to keep an eye on your most recent links in Google Webmaster Tools and then disavow any new links that come up that concern you. If you do that, these guys will have a hard time hurting your site. The overall concern is that with the Penguin algorithm and all the manual actions around link penalties, SEOs and webmasters feel it is easier than ever to perform negative SEO on a site. This perception is an issue in an already ‘black-eyed’ industry. If you receive this letter, please report it immediately to Google or contact us, and don’t take it lightly. This means that you should check your Google Webmasters account regularly, and use the link checking tool. If you don’t already have a Google account, you’ll need to sign up for one. Just go to Google.com and click on ‘You’. Then sign up for an account. 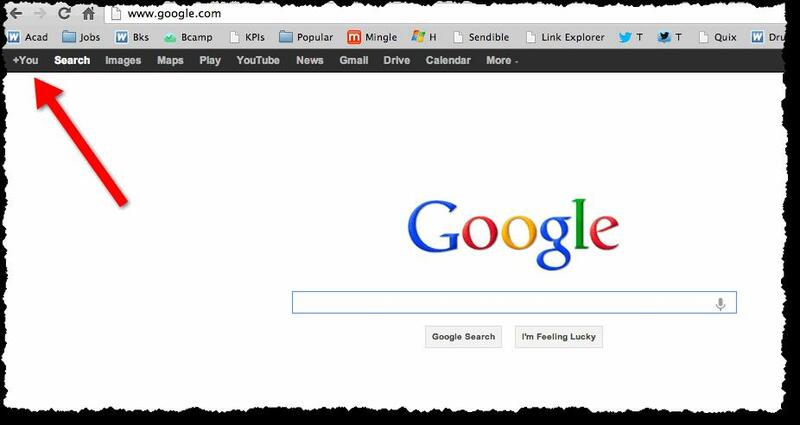 This will give you a Google Gmail address as well as access to other Google applications. To set up Webmaster Tools, visit http://www.google.com/webmasters/tools and sign in with your Google account – preferably the same one you use for GA.
Click ‘Add a Site’. And enter yoursite’s URL. Next, you’ll need to verify that the site is yours. You’ll be given a number of options, but the easiest way is to verify via your GA account. For this to happen smoothly, you’ll need to be an administrator of the GA account (if you’ve only got ‘User’ permissions; ask the site’s Administrator to upgrade you). That’s it. Your account should be authorized and ready to use. 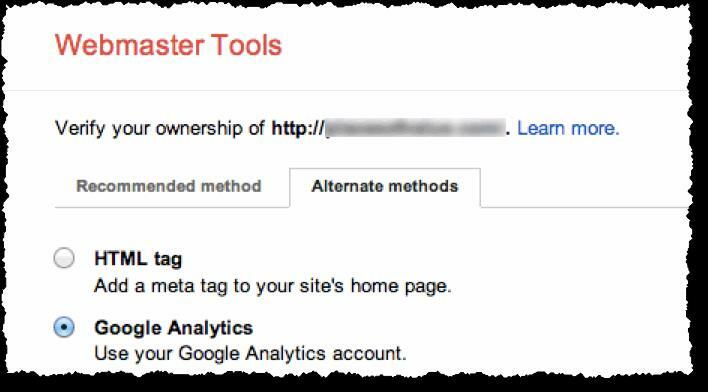 Though, when you’re setting up Webmaster Tools for the first time, it may take a few days for data to appear. That’s about it. If you have an outside person or company managing your website, make them aware of the situation and remind them to monitor your Webmasters account and to notify you of anything that looks suspicious and to report it immediately. This is not meant to cause panic and to go running into the streets in terror, but we want to stay ahead of this for our clients and the rest of you out there.